U-Cable Guard 3 11/16" inside diameter x 8' long. Protect telephone and powerlines where circuits lead from underground to overhead. U-Cable Guard with booted end. 4 3/8" inside diameter x 8' 73/4" long. Protect telephone and powerlines where circuits lead from underground to overhead. U-Cable Guard Straps are made from hot dip galvanized flat steel, shaped to fit the Catalog numbers C203-0452 & C203-0450 guards. U-Cable Guard Straps are made from hot dip galvanized flat steel, shaped to fit the Catalog number 6531 & 6531-1/2 guards. RUS Listed. U-Cable Guard Straps are made from hot dip galvanized flat steel, shaped to fit the Catalog numbers 6532 & 6533 guards. RUS Listed. U-Cable Guard Straps are made from hot dip galvanized flat steel, shaped to fit the Catalog numbers 6534T & 6535 guards. 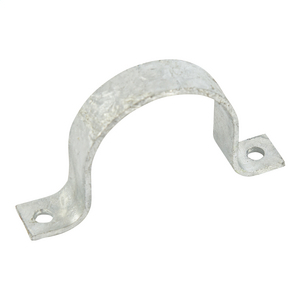 U-Cable Guard Straps are made from hot dip galvanized flat steel, shaped to fit the Catalog number C203-0451 guard. U-Cable Guard Straps are made from hot dip galvanized flat steel, shaped to fit the 1" cable gurads. Flanged one-piece cable guard 2" inside diameter x 9' long is formed of 14 gauge steel. Hot dip galvanized. Mounting holes in 1" wide flanges are located every 25". Flanged one-piece cable guard 3" inside diameter x 9' long is formed of 14 gauge steel. Hot dip galvanized. Mounting holes in 1" wide flanges are located every 25". 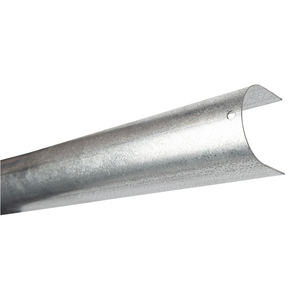 Flanged one-piece cable guard 3-1/2" inside diameter x 9' long is formed of 14 gauge steel. Hot dip galvanized. Mounting holes in 1" wide flanges are located every 25". 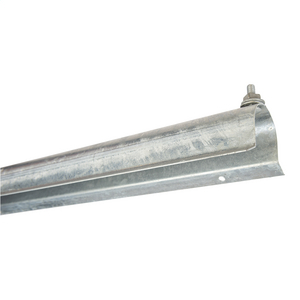 Flanged one-piece Extension cable guard 2" inside diameter x 5' long is formed of 14 gauge steel. Hot dip galvanized. Extension is flared at one end so that it can be joined to the base section. Flanged one-piece Extension cable guard 3" inside diameter x 5' long is formed of 14 gauge steel. Hot dip galvanized. Extension is flared at one end so that it can be joined to the base section. U-Cable Guard with booted end. 1 1/8" inside diameter x 5' long. Protect telephone and powerlines where circuits lead from underground to overhead. U-Cable Guard with booted end. 1 1/8" inside diameter x 8' long. Protect telephone and powerlines where circuits lead from underground to overhead.